Lean Management, also known as Lean Enterprise and Lean Manufacturing, is a management philosophy based on the Toyota Production System (TPS). The objective of Lean Thinking is to eliminate everything that does not add value from the customer's eyes. Lean Management is a management philosophy based on the Toyota Production System (TPS). This management philosophy was coined "Lean" only in the 1990s. The objective of Lean Thinking is to eliminate everything that does not add value (i.e. "waste") from the customer's perspective. The general approach to Lean is learn-by-doing and to foster a culture of continuous improvement. In a Lean organization, we develop a value stream for each service family, make the product or service flow, and then continuously improve our process as we manage towards perfection. To achieve this goal of managing to perfection, there is a vast range of Lean techniques and tools available, which have been established and tested with numerous case studies. Examples of Lean frameworks include Value Stream Mapping (VSM), 5S, Kanban, Kaizen, Poka Yoke, Gemba Walk, Hoshin Kanri, Plan-Do-Check-Act (PDCA), Root Cause Analysis (RCA), Heijunka, etc. Just-in-time (Pull System): Delivering only what is needed, when it is needed, and in the amount needed. Jidoka (Quality): The ability to stop the process in the event of problems, e.g. missing information or quality issues. Jidoka helps prevent the passing of defects, helps identify and correct problem areas. There are numerous business and organizational benefits to adopting a Lean organization. Some of these benefits include improve customer satisfaction (both internal and external), improve qualify of products or services, improved employee productivity, reduced paperwork, reduced employee stress, and more engaged employees. 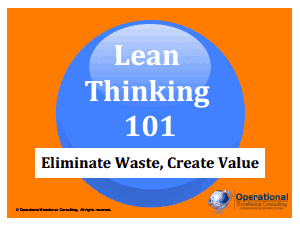 A couple key concepts in Lean Thinking are that of "value" and "waste." Activities can be categorized into those that add value and those that don't. Value-added activities increase the form or function of the product or service. They are activities the client or customer is willing to pay for. On the other hand, non-value activities do not add form or function or are not necessary. They do not benefit the client or customer. They are things that are not necessary to run the department. These activities, in Lean terms, are called waste. This 32-page presentation explains the Lean Management philosophy, based on the Toyota Production System (TPS). Learn to eliminate everything that does not add value in the customer's eyes. Download a FREE PowerPoint on Lean Management. The goal of Lean is to eliminate this waste. In fact, Lean Management can be defined as a systemic method for the elimination of waste within a business process. Over-production. Producing more than what the customer needs. Examples include Creating reports that no one needs or making extra copies, exceeding scope of agreement, purchasing items before they areneeded (e.g. items on sale), etc. Waiting. Employees waiting for another process or a machine/tool. Examples include waiting to be served, waiting for instructions/approvals/information, equipment/System downtime, etc. Rework. Reprocessing or correcting work. Examples include data entry errors, poor process controls, incorrect schedules and information, etc. Transportation. Moving product from one place to another. Examples include poor workplace organization, insufficient use of tele-/video-conferencing, double or triple handling, etc. Inventory. Building and storing extra services/products the customer has not ordered. Examples include e-mails waiting to be read, business documents waiting to be worked on, too many office supplies, etc. Motion. Extra physical/mental motion that doesn't add value. Examples include searching for information on internet/computer, handling paperwork, unnecessary motion due to poor ergonomics or office layout, etc. Over-processing. Adding excess value when the customer does not require it. Examples include repeated manual entry of data, excessive documentation, multiple formats for the same information, etc. Intellect. Not using employees full intellectual contribution. Examples include not engaging or listening to employees in finding solutions, lack of best practice sharing, mismatched work functions with skill sets, etc. Just another set of "extracurricular activities"
To better understand how Lean differs from conventional management philosophy, let's look at several examples comparing these schools of thought. This article provides a very rudimentary introduction to Lean Management. To develop a more in depth understanding, we suggest downloading a free copy of the 32-slide Introduction to Lean Management presentation and consulting the business training guides below. Flevy's document contributors are Subject Matter Experts in their respective industries. Below, we have showcased our authors that specialize in Lean Management and Lean Six Sigma. Each of these authors and their respective consulting firms have developed training guides on Lean Six Sigma. Flevy is the leading online provider of business frameworks, methodologies, and training guides. These documents are of the same caliber produced by top tier consulting firms, like McKinsey, Bain, and Deloitte. Most documents were developed by seasoned executives and consultants with 20+ years of experience. The training guides selected below have all been developed by management consulting firms specializing in Lean Management and Lean Six Sigma. The select training guides below have all been developed by the subject matter experts showcased above.